Our shepherds huts are new on Dartmoor. They are modern, timber built structures made on our farm in the traditional style. 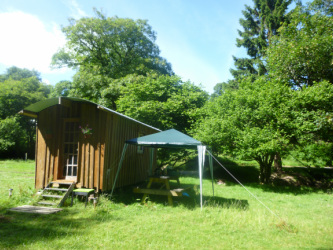 The Shepherds Huts are situated in a quiet Dartmoor valley with woodland on one side and the holy brook, which runs of the moors, on the other. Shepherds huts were traditionally used by shepherds for shelter and a place to sleep whilst guarding their flocks by night. They are eco-friendly, insulated with lamb’s wool, straight from our sheep! The huts come equipped with a double bed, hanging space for clothes, a sheepskin covered bench, table, cooking hobs, sink, linen, towels, cooking pots and utensils are provided, BBQ and picnic table, with gazebo. There is also a fire pit for camp fires (logs are available on site). The shepherds huts sleep 2 (double) and can sleep another 2 people on air beds. Also you can hire a bell tent at a reduced price to go alongside the shepherds hut and have the children sleep next door, they will love that! _Copyright © 2012 Dartmoor Shepherds Huts. All Rights Reserved.